To hit ‘em where they ain’t. Many of the original and innovative contributions to the field of urban sociology came out of the University of Chicago in the early 20th Century. Influenced by the natural sciences, in particular evolutionary biology, members of the Chicago School forwarded an ecological approach to sociology emphasizing the interaction between human behavior, social structures and the built environment. In their view, competition over scarce resources, particularly land, led to the spatial differentiation of urban areas into zones of similar use and similar social groups. Two of the major proponents of urban ecology were Ernest Burgess and Robert E. Park, professors at the University of Chicago, who together in 1925 published a book entitled The City. In it, they propose a model for the spatial organization of cities called concentric zone theory which along with Hoyt’s sector model andHarris and Ullman’s multiple nuclei model is considered a classic model of urban land use. 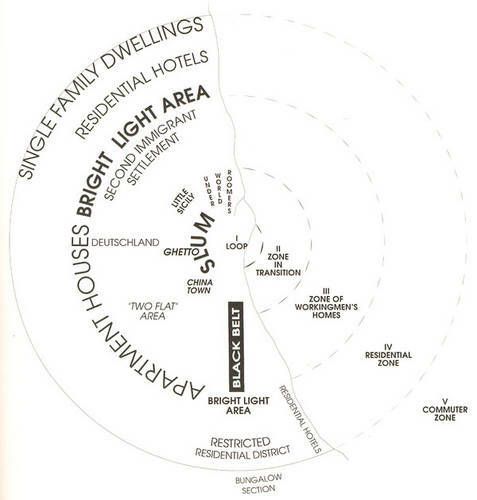 In the concentric zone model, the center of an urban area is occupied by its primary business district and is surrounded by rings of different land uses and urban forms. Implied by the model is the idea of residential succession – that people, particularly immigrants, will move outwards from inner-city slums as they assimilate and/or gain higher economic status. Though they were both sociologists, Burgess and Park made extensive use of maps and field work to illustrate and elaborate their theory. The city of Chicago was their backyard as well as their laboratory, and they used the concentric zone model widely to explain the spatial distribution of social groups and social problems that they and their students observed within different parts of the city. While some sociological aspects of the concentric zone theory like residential succession no longer apply to Chicago as they did in the 1920s, certain elements of the model are still visible in the city’s landscape today. In the map above, which shows the footprint of every building in Chicago color-coded by the period in which the structure was built, a pattern of concentric zones is quite strikingly apparent. Much like the rings of a tree, as you trace your eye outwards from the Loop, each surrounding halo of housing is younger. Though the time periods I chose to make this map are somewhat arbitrary (the 1893 World’s Fair, the two World Wars, Ronald Reagan), it provides insight into the geography of growth and real estate investment in Chicago. In the 1920s, when Burgess and Park were developing their model, the structures you see colored in green were freshly built and constituted the outer-lying middle class neighborhoods in which people strived to live. Those structures colored in blue were older and constituted the poorer, working-class districts where many immigrant groups lived (see diagram). Fascinatingly, though the city’s population peaked in the 1930s, new homes continued to be built in successive rings up until the 1970s when it appears that the orange ring on the map pushed beyond the city limits. Over this period, for variety of reasons not adequately explained by concentric zone theory, the areas seen in green were largely abandoned by the middle class and are now some of the more impoverished parts of the city – Lawndale, Humboldt Park, Garfield Park, Englewood. Since the 1980s, real estate development in Chicago has occurred within already established neighborhoods, and most new structures built in city of Chicago over the last 30 years are located downtown in the Loop, Near North Side, South Loop or West Loop areas. A benefit of using the concentric ring model to interpret this map is that it enables us to draw comparisons between neighborhoods and identify places where the model breaks down. For example, there has been a far greater infill of new housing (red) in Lincoln Park and West Town than in Bridgeport or Pilsen, all neighborhoods with the oldest housing stock. Similarly, the South Loop, West Loop and Near North Side look as though they should be part of the blue ring of old houses but instead feature much newer construction. 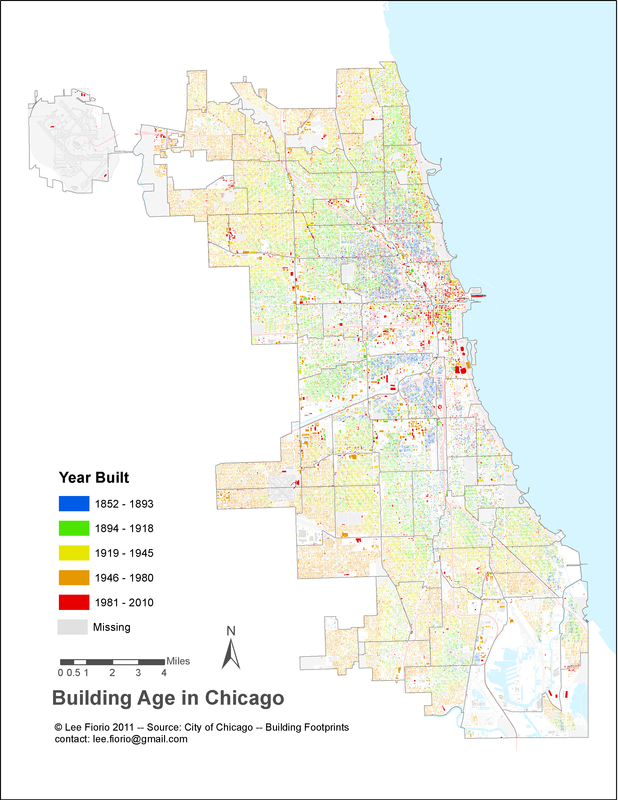 Though I have not run any kind of statistical analysis, I would wager that the Gold Coast/Near North Side community area contains the highest concentration of new structures built after 1980. I’m also interested in the patches of blue buildings that appear in other areas of the city like Austin (the furthest area directly west of downtown), Englewood (about 4 miles south of the Loop, a mile west of Hyde Park), Pullman and Roseland (south of the junction of I-94 and I-57) and South Chicago and the East Side (near where the Skyway enters Indiana). For the most part, these far flung clusters of old structures speak to the oddly-shaped and long-forgotten growth pattern of the city of Chicago. Areas seen on the map in green and blue were developed mostly before the invention of the car and as a result are grouped around rail lines and major arterial streets stemming from downtown like State, Lake, Milwaukee and Archer. To get a better idea of what Chicagoland looked like in the first half of the 20th century, check out this map of subdivided and occupied land in the Chicago area in 1930. It does a good job demonstrating how the city expanded along train routes. A final take-away from the concentric zone model as applied to this map is the degree to which similarly aged buildings are grouped together throughout the whole city. A pattern of concentric circles would not be visible on a building age map unless this was the case. It may seem obvious to most, but it is kind of mind blowing to me that as I walk down any given residential block in Chicago, chances are all the buildings were put up around the same 25 year stretch. To download a high-resolution PDF of the building age map click here. It looks great, but it’s very large (20.5 mb). Park, Robert, Ernest W. Burgess and Roderick D. McKenzie. The City. Chicago: University of Chicago Press, 1925. Cool map, I’d love to see some corresponding photographs! Just stopping by to let you know you have a brand new fan! Reading one post on your website made me obsessed there and then.